Every year, our Clubs nominate their Youth of the Year – an exceptional leader and role model for his or her fellow Club members. From that group of finalists, a panel of judges selects one member as BGCB’s Youth of the Year. This year, BGCB’s Youth of the Year is Adonis L. from the Yawkey Club of Roxbury. Adonis describes his vision for America’s youth as a place where “each individual is guaranteed at least one breath of fresh air.” After moving to the U.S. from Jamaica at the age of nine, Adonis was amazed at how the clean air improved his quality of life. In Jamaica, Adonis always needed an inhaler to manage his asthma; in Massachusetts, he barely used it. This realization sparked his passion for environmental issues, which was reignited after he participated in BGCB’s Explore India program. A top student in the selective program, Adonis spent two weeks overseas immersing himself in the culture and observing the environment. Inspired by his time in India, Adonis returned to the Club ready to raise awareness around environmental issues, not only within his Club community but also across the country and globally. In addition to advocating for the environment, Adonis demonstrates a zeal for social justice through his participation in the Do the Right Thing Club and the Melrose Alliance Against Violence Student Action Board at his school. One Club staff aptly described Adonis as a “dynamic teen with limitless leadership potential.” During his four years at the Club, Adonis transformed from a shy and quiet kid to Vice President of the Keystone Club and even performed spoken word in front of more than 2,000 people at the Keystone National Conference. 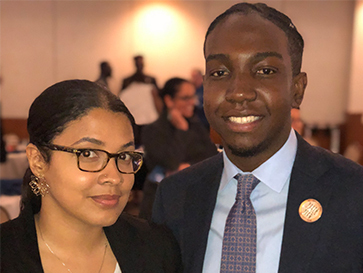 As a Posse Scholar, Adonis will further pursue his passion for studying Environmental Sciences at Centre College with a full-tuition scholarship. His community from the Yawkey Club and BGCB will be cheering him on. Read about each BGCB Youth of the Year finalists here.